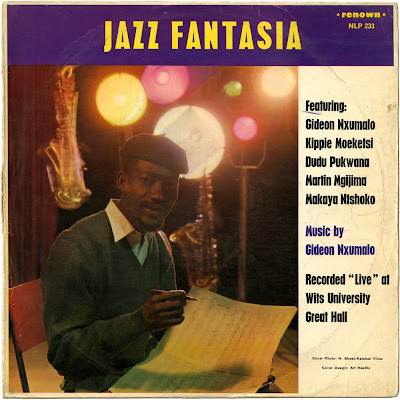 True to its name in both form and spirit, Gideon Nxumalo’s 1962 Jazz Fantasia is a key document of modernist South African jazz. Vital, ambitious, consummate in conception and execution, it is perhaps the crucial small group recording of the early 1960s, and one of the few complete sets by a small modernist group to have been released on LP during these years. Nxumalo’s compositions are taut and boppish, in places unmistakably water-marked by the language of mbaqanga jazz, but speaking fluent bop – ‘Isintu’ in particular knits the melancholic mbaqanga chords which underpin the piece seamlessly into the bebop-styled changes of the main section. The line-up features the extraordinary conjunction of two of the foremost altoists in jazz history, Kippie Moeketsi and Dudu Pukwana. There is a sense here that the guard is changing: this is one of the last commercially released recordings to feature Moeketsi before a combination of drink, depression and disillusionment effectively silenced his horn for the remainder of the decade. 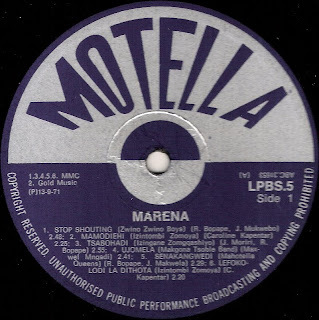 Pukwana’s star, on the other hand, was in the ascendant: he had been part of the winning band at the Cold Castle festival that same year, and was soon to depart for Europe where, as part of the Blue Notes,his unique approach to his instrument would help redefine the language of European jazz over three decades. 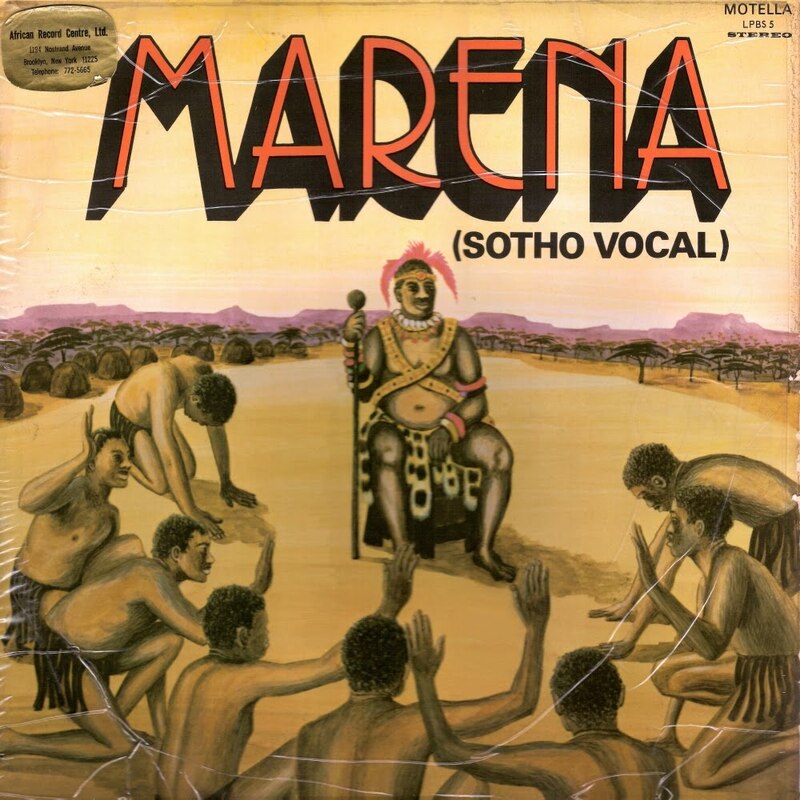 In 1962, very few people anywhere in the world were playing the horn as Pukwana does here. His better known UK and European recorded history often leads to him being regarded as part of the second wave of radical and free musicians, but recordings like this (listen to his solos on ‘Chopi Chopsticks’ or ‘Split Soul’) make it quite clear that he should be seen as a primary innovator in the fracturing and loosening of the saxophone’s conventional syntax and voice. Nxumalo himself is an absolutely central figure in the development of modernist jazz sounds in South Africa. 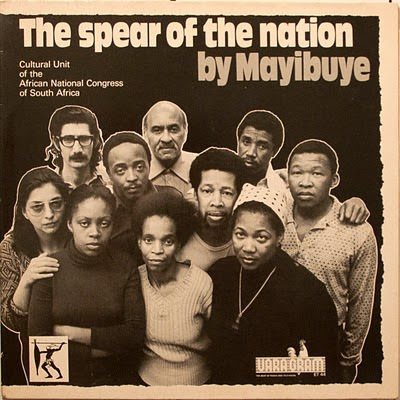 As ‘uMgibe’ he hosted the This is Bantu Jazz radio show on the rediffusion service from the early 1950s onwards, until his dismissal for playing politically charged music in the aftermath of the Sharpeville massacre. A university trained pianist, he taught piano and theory at Dorkay House, and he composed the music for the Sponono musical, the first South African production to play on Broadway. 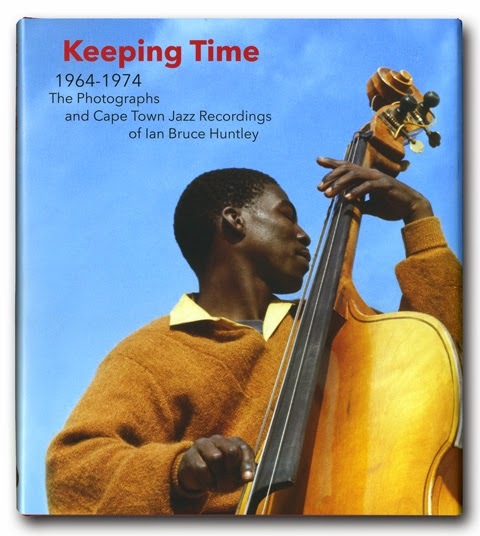 As evidenced here, his playing is of singular stamp and his compositions are radical and exploratory, but as with so many South African innovators, his recorded footprint is frustratingly small and incredibly hard to find. The few LPs issued under his name are so rare that in musical terms he has become a virtually unknown quantity. But his stature is in no doubt. Recorded live at Wits University on 8 September 1962, both the original Renown pressing of Jazz Fantasia and the 1991 Teal ‘African Heritage’ repress suffer from patchy sound quality, which can probably be put down to the circumstances of the recording. It cannot mask the quality of the sounds. NB. The back cover notes list a track called ‘Waltz in F’. This track does not appear on any issue of the LP. 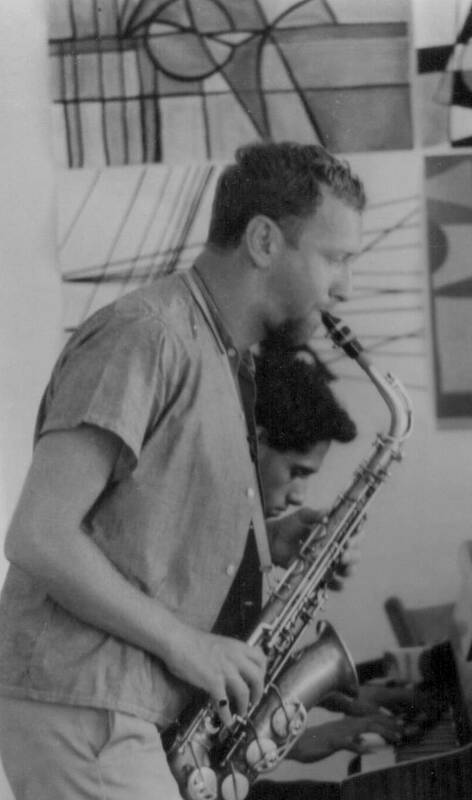 This rare and unheralded recording showcases the jazz song-writing of Cape Town’s David Bravo and Morris Goldberg. As in much of his future work as a bandleader, Goldberg infuses an African, Cape Town and sometimes mbaqanga idiom into a latin and jazz-fusion melting pot. Goldberg was part of the early wave of music exiles, moving to England in 1960 and then, with the help of Hugh Masekela, settling in the United States in 1962. Since then he has backed the greats, including Masekela (Uptownship, 1989); Paul Simon (Graceland, 1985), amongst others. Fortunately for South Africa, Goldberg keeps coming back: In 1974 he returned to record “Mannenburg” with Abdullah Ibrahim. In 1975 he recorded two albums in South Africa for two different labels. 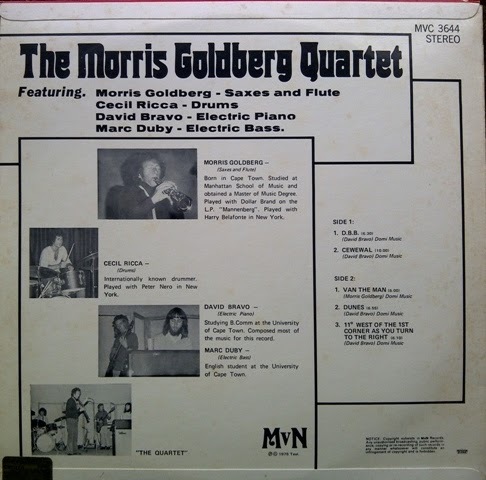 Morris Goldberg’s Urban Jazz Band was featured earlier on this blog here. 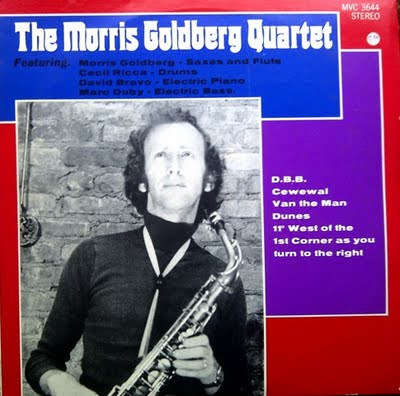 Today’s line-up is Goldberg, Cecil Ricca (drums), David Bravo (Electric Piano) and Marc Duby (bass). 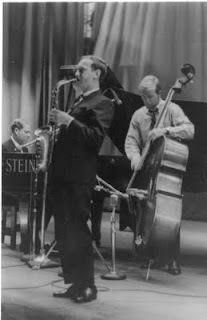 In 1983 Goldberg teamed up with Tony Schilder (piano), Gary Kriel (bass) Cecil Ricca on drums and Merton Barrow (vibes) to play the Baxter Theatre in Cape Town. “Jazz in Transit”, the double album of those shows is recognised as a world class offering. The album was released on CD in 2006, and again in 2009, and can be purchased here, and as an MP3 download here and here. 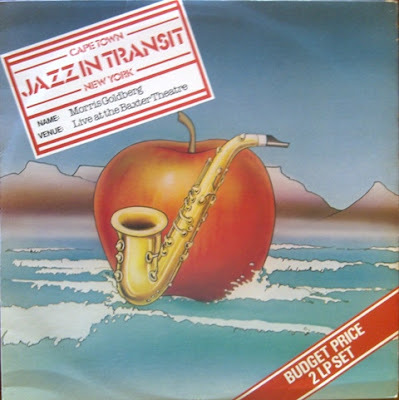 For reasons of space, the "Jazz In Transit" CD releases do not contain the last two tracks of the original vinyl double album: “Sometimes I feel like a Motherless Child” and Chick Corea’s “Spain”. These two tracks can be downloaded as a bonus below. Goldberg heads up a highly successful U.S.-based SafroJazz band “Ojoyo” featuring the likes of Bakithi Khumalo (bass) and Bheki Khoza (guitar). They have produced three CDs which can all be found here. Ojoyo played the Cape Town Jazz Festival in 2005, and four Grahamstown festivals in the 1990s. Recorded at the Manley Van Niekerk (MvN) studios in 1975. We have ten winners nicely spread across Africa, South America, Europe and the U.S.A. - please let us have your mailing addresses so that we can post you the promised packages. Thank you to all who took the trouble to write in. The overall message was "more of the same please". So, we will continue as we have been doing. Your comments really do make a difference, so please do keep them coming. Requests are always welcome. 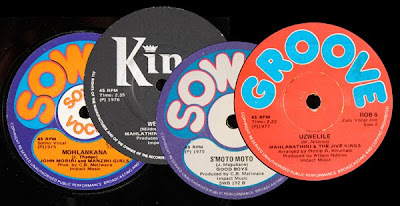 John Warr (Chapita LP); Rob Lischke (Chapita LP); Tim Clifford (Mahotella CD); Olivier Ledure (Mahotella CD); Frank (dr.crackle) (Mahotella CD); Greg Davis (Mahotella CD); Fabian Romero; David Sullivan; James Silberbauer; Pieter Remes (the last four will each receive a 5-pack mbaqanga 45rpms from the 1970s). Record Store Day Jive Bonanza - A three way giveaway! 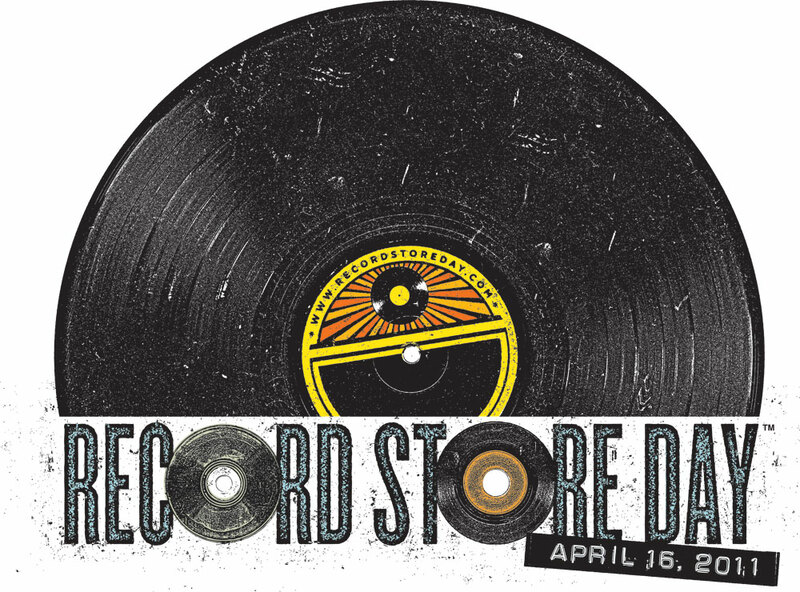 Electricjive, flatinternational and Matsuli Music have joined forces for a Record Store Day giveaway. So we don't have a retail store made from bricks and mortar. But that doesn't stop us from spreading our love of records. And better still no money changes hands. We simply give the records to you. We won't even ask you to pay the postage. We get lots of pleasure out of sharing great music, honouring the musicians who make it, and we hope to turn on a whole new audience to fantastic out-of-print sounds that might otherwise become lost to global memory. We avoid sharing music that can still be legitimately purchased. So ten winners in total and all you need to do is to send an email to recordforthe AT gmail.com telling us why you visit our sites and what music you would like to see more of. We will select the winners at random and close the competition after 5 days. This is part two of a series of posts themed around political propaganda. In many ways its an update to an earlier post at Matsuli where Matt detailed the origins and recordings made by the ANC's Amandla Cultural Group. Its worth repeating what was quoted in that post to give context to the recording which is being shared today. The Amandla Cultural Ensemble first performed at Festac in Nigeria in 1977 and the following year at the Cuban Youth Festival. 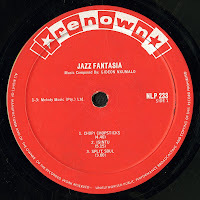 Their first recording was made at Radio Luanda and Radio Zambia studios during 1980 and released internationally by the Swedish Labour Movement Record Company in 1980. The first international tour took place in 1981 in Sweden. The musical director of Amandla was Jonas Gwangwa, one of the stalwarts of South African jazz. A return to jive for this post - and if this LP we are sharing today does not fall under the category of "classic mbaqanga", I don't know what does. This rarity is Marena, one of the many compilation LPs released on the Motella label in 1971 that represented the best tunes of the past year - though "best" may be something of an understatement. - Mahotella Queens, with guest vocals from Mahlathini on "Jive Makhona" and Lazarus Magatole on "Senakangwedi"
Musically, this album represents an exciting and enlightening time as far as mbaqanga music was concerned. Artwork-wise - well, see for yourself!! ...download, listen and get jiving!